That is funny! 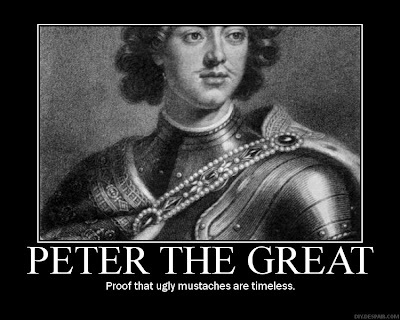 When I was in England this summer visiting Kensington Palace I saw this original portrait of Peter. It was overwhelming! It was so BIG!!! From floor to ceiling and in color done by Van Dyke I believe. It was actually the only thing in this large room. I just stood and stared. I remember reading in Masse's book that when Peter visited London when he was young his portrait was painted. Well I tell u that post script is funny.. but dnt u think the portrait is STRIKING! I think he looks good :) really good :) LOL! That was funny! Made me look twice, and sure enough, it was pretty bad.